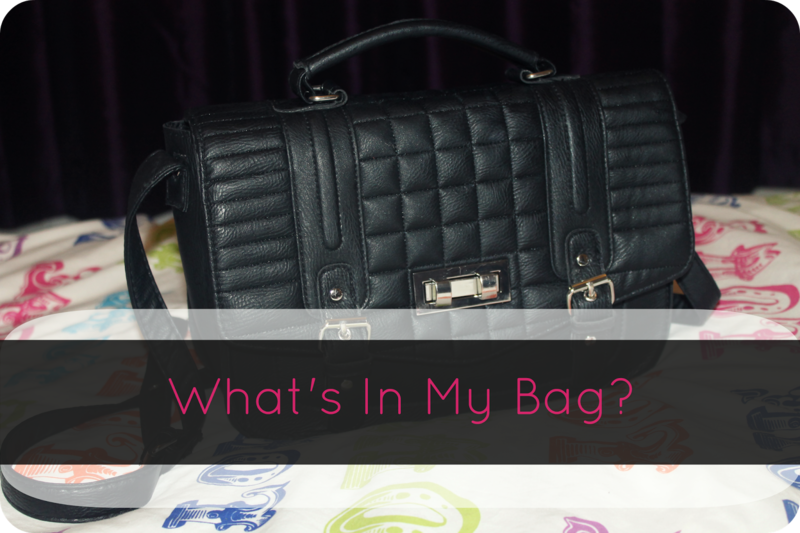 I've decided to challenge myself a little and do "What's In My Bag? in a blog post rather than do what most people do and Youtube it! I thought it'd be nice to do this post for you as it's still a little introduction into who I am and I think it's a great idea for me to try and include what products I use/own as I'm still a young blogger who's just started, meaning everything I use and post about is found on the high street! First thing is first, my bag is from New Look which I actually bought a few days ago, I find it so hard to find a black and silver bag as everything has gold on now, so this was a no hesitation buy. Inside the main part of my bag you'd find my small cosmetics bag which is from Claire's Accessories, I tend to carry my concelear, lipstick, lip balm and powder in this, I've had this bag for so long I can't remember how much it costs, oops! I also like to take my travel Batiste Dry Shampoo in my bag on days when my hair needs a little boost, it's great to carry around as it's so small and it only costs £1.50 from Superdrug. Headphones are always in my bag, these are just normal remote Apple headphones, I don't really need to explain these! I bought the Mr. Messy Anti-Bacterial Hand Gel a while ago and I have probably used it once, I just love Mr. Men and like the idea of having something in my bag to clean my hands with if I don't have wetwipes, I know it's meant for children but it's so cute and only cost about £2.00 so I couldn't resist. The most important thing to have in my bag in my Purse, mine is a zip and stud embellished black purse from New Look which I got a while back to match a bag I bought, it's lasted me well! New Look purses tend to cost £9.99 Lastly is obviously my iPhone as no bag is complete without a phone! In the smaller front section of my bag is where I take the smaller compact items although a couple of these items do move to and from the front section to the zip pocket inside hehe. I have started carrying around bobby pins in my bag as they seem to disappear whenever I need one and this way there's always some with me wherever I go, these ones are from New Look for just 99p, they're also brown so they're not so obvious in my hair. Chewing gum is a must have for me, I normally have a tub but in this bag it's easier to have a small packet of the Extra Spearmint flavour which are so cheap. The next item I always have is a packet of tissues. This packet in particular is my favourite because of the hippie van, you can get cool packets like this in shops like Accessorize and New Look for 99p! Lastly is ibuprofen as I get headaches way too often and I always need tablets, obviously these aren't an essential for everyone as you should only carry these around with you if you know you need them. I hope this post has been a little opener for you and I'll probably do another What's In My Bag when it turns into winter and I'll be carrying different items!